UK GERS figures claim that Scottish spending leaves the Scottish economy with a £13.4 billion blackhole. 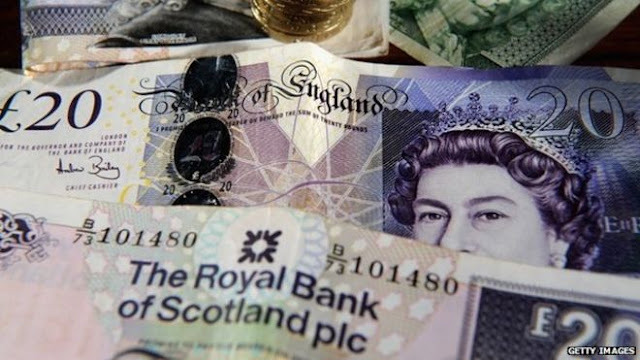 The Government Expenditure and Revenue Scotland figures claim £74 billion is spent either in Scotland, or a percentage share of UK wide spending on Scotland's behalf. Here is a possible list of savings that could be made to the Scottish budget after independence that would offset this so called "Scottish black hole." Given the fact that we're 8% of the population but they imagine a scenario where Scotland is responsible for 10% of the UK wide cost, it is reasonable to assume that we could make massive savings with Public services costs, especially compared to Irish costs. Our share of general government costs will be gone, since we'll no longer have to contribute towards running the British Government whatsoever. 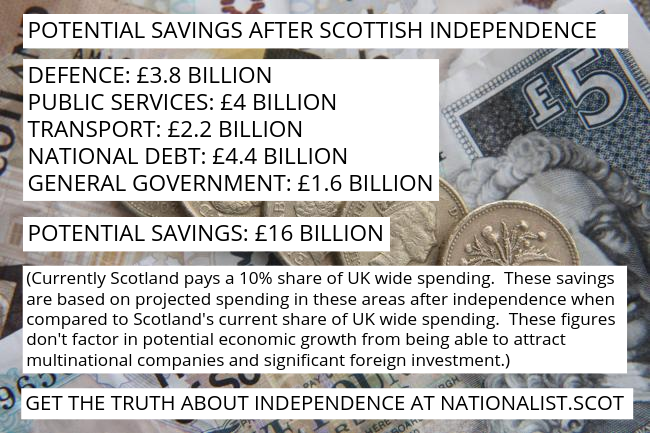 So that's savings £16 billion annual savings straight away, on day one of independence. It is reasonable to also consider that Scotland could make a significant saving on tax administration costs, according to Mirrlees and Beveridge reports. It is also reasonable to suggest that saving could be made to Scotland's current contribution to borders security, especially in comparison to Irish spending. There you go, after independence, there is no black hole. Scotland's future is actually brighter as an independent country. Now of course, we are not taking into account the potential tourism boom after an independent Scotland. We are also not taking into account the potential for multi national companies to move to Scotland, providing extra billions to the economy. GERS figures do not take into account for example, that 16 of the top 20 companies in Ireland are US multinational companies that are only there because as an independent state, Ireland is allowed to offer competitive corporation tax deals to attract these companies to come to their country. Scotland could benefit to the tune of tens of billions of pounds by having control over corporation tax rates. So not only is there not a black hole - Scotland's economic capabilities are actually being strangled while it remains a third state of the United Kingdom.